Lancaster City forced league leaders Northwich Victoria to a replay on Wednesday night, but either side could have won this evenly-fought contest. Lancaster City held league leaders Northwich Victoria to a 1-1 draw in the preliminary round for the FA Trophy. Despite dominating the opening portion of the season and the match, Northwich were pegged bag in the second half thanks to a Matthew Poole finish, despite leading the game since the opening minute. Lancaster arguably finished the game the strongest, but ultimately lacked the clinical touch to avoid a replay on Wednesday 7th. In a match marking captain and club legend Neil Marshall’s 400th game for the Dolly Blues, Northwich showed they weren’t here to fit the script by opening the scoring after just 40 seconds. Ian Howard’s volley through a crowded penalty area was the reason, following a clever far-post header by Abou Sanogo. Lancaster keeper Mike Hale was given no chance, with impaired vision and deflections his downfall. Though the league leaders failed to capitalise on this bright start, and lazy defending allowed Pearce to bobble a shot home on the hour mark after a deep free-kick eluded the Northwich defence. Lancaster were then the better side, but still were unable to find a winner, despite many half-chances. Lancaster stalwart Marshall was greeted to a guard of honour by both teams when he entered the Giant Axe pitch, but things took a turn for the worse immediately. A 50/50 challenge resulted in Marshall not only being forced off for minor treatment after a few seconds, but also in a free-kick from which Northwich duly capitalised. Without the defender’s presence, Lancaster seemed to lack structure and couldn’t deal with a bouncing ball in the box. Many feared the worst after this poor start, as Northwich had scored 26 goals already this season, and had only dropped points once in the league. Yet Lancaster were straight back at their opponents, and skilful playmaker Ryan Winder played a delicious ball into the box which keeper Dane Smith failed to deal with. However no-one in the Lancaster squad could take advantage of this nervy moment. The intent was clearly there for the Dolly Blues, but more often than not, it was to no avail. Lancaster had a few half-chances, but none that really tested Smith until the 25th minute, when Pearce rocked the post with a thunderous shot. But that wasn’t before Howard almost doubled things for Northwich if it wasn’t for Lancaster’s goalposts following a snapshot. Northwich were much sharper and intimidating than Lancaster, but failed to have any more chances since. Lancaster’s long balls were quite often lazy, but they still resulted in more opportunities, including Poole’s low diving header, which was comfortably saved by Smith. Controversy reigned though on 37 minutes, when a defensive mix-up in the Northwich box from a corner resulted in a rash goal line clearance. Ask the majority of the crowd whether it was in or not and you’ll probably get a conclusive answer of goal. But the referee and linesman disagreed. Lancaster were much more impressive in the second half, with slick passing and technical long balls pleasing much of the crowd. Many fans feel that this was the result of former managers Darren Peacock and Trevor Sinclair’s departure earlier in the week. This was only Lancaster’s second match since, but some saw it coming. One fan claimed that Peacock ‘bled the club’ whilst still failing to bring in new players. Another agreed, claiming that their play previously was too slow, and now they played with intensity and focus. Much of this was also down to schoolboy Hannu Tam’s arrival at half-time. He gave Lancaster pace and agility, immediately shirking past three Northwich players on a mazy run. Although often his energy was misplaced, it should at least give fans faith that they could produce such ability. A fiery shot by the youngster hit the side-netting, but it at least highlighted that a goal was coming. And indeed it was, just after the hour mark. 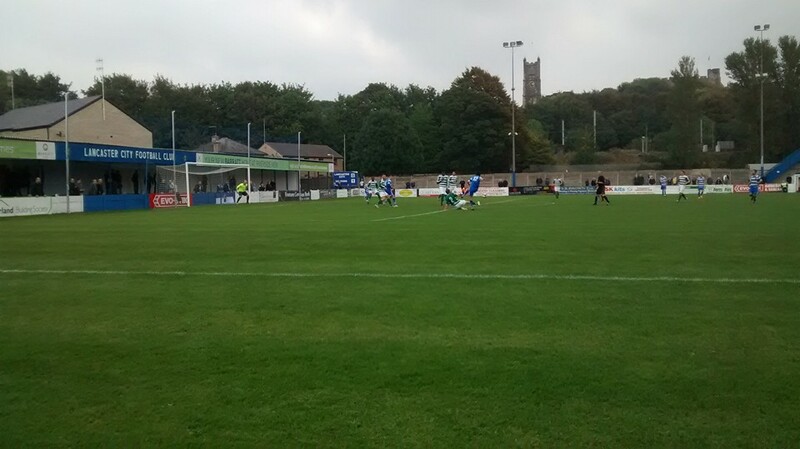 A long free-kick from the half-way line found itself to Poole, and although his connection wasn’t sweet, it was enough to bobble past Smith to give Lancaster a deserved equaliser. Josh Amis almost re-established Northwich’s lead though straight from the kick-off as he found himself one-on-one with Hale, but the Lancaster keeper made a glorious save with his legs to keep the game level. Despite Lancaster easily defusing the rampant league leaders in this cup game, the game fell to a slight lull after that chance and neither keeper was forced into a meaningful save. Poole’s poor control after finding himself unmarked at the edge of the Northwich box was perhaps their final chance, as they struggled to convert their possession into chances. Several times they broke and a counter attack was imminent, only for a sloppy pass to ruin any momentum. In the four minutes of injury time thanks to goalscorer Poole’s slight knock, both teams had dangerous free-kicks at the side of each other’s boxes, but neither were converted efficiently. On paper, Lancaster will probably be the happier side with this result, and can take away the knowledge that they can easily frustrate the league leaders in the replay at Wincham Park on Wednesday 7th. But ultimately, another replay could see another injury, so both teams will probably be disappointed that they didn’t put the game to bed when they had the chance.